I've a cyclamen plant in my kitchen. My drawing shows it as it was last Christmas. Now it's 35cm high, with seventeen white flowers and more on the way. 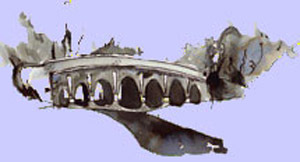 It has numerous dark heart shaped leaves with serrated edges. The largest leaves are rather larger than a CD and they all carry a pale green pattern. The flowers point downwards because the stem has an 180 degree turn at the top, and the petals fold backwards and upwards. Insects seeking nectar have to climb into the flower from below. shepherd's crook, and then the petals start to grow. After that, leaves appear in profusion plus more and more flowers. We've had the plant four years, and the cultivation instructions tell us it would not thrive out of doors. However, you can buy cyclamen corms from Ayletts and other garden centres. We bought some a few years back and planted them under bushes - the sort of places few flowers thrive. And each autumn, the cyclamen flowers appear - usually pink - although you can get white ones, and the flowers die back before the leaves appear. At the tallest, garden cyclamen grow to 8cm, and they appear identical to the wild variety. 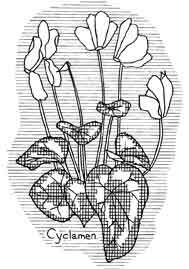 If you read an old book on wildflowers, you are unlikely to see cyclamen mentioned at all - as they were so rare. If they are mentioned, they are called 'sow bread'. At one time, cyclamen were confined to woods at Shillingford St George in Devon, and Ibstone in Buckingham. Several years ago I found cyclamen growing at Offley, between Luton and Hitchen and as they were near housing, I guess they were descendants of planted flowers. However, global warming means many flower species now grow healthily where they were once unknown. Today cyclamen grow in Britain mainly south of a line through the Wash.
We often hear commentators bemoaning the decline of wild life - particularly large mammals like polar bears and tigers. However, many species are increasing their range. The rise of air temperatures in Britain mean that each year, many types of wild flowers are found further north than previously recorded, and the same is true of insects and birds. If you are interested in wild flowers, there are many fine books about them. Possibly the book I refer to most when trying to identify wild flowers is the 'Wild flowers of Britain and Ireland' by Marjorie Blamey, who did the pictures, and Richard and Alistair Fitter. It costs £16.99, and my copy came from Borders' bookshop. Another book which is eminently readable is Richard Mabey's 'Flora Britannica'. This book tells the folklore associated with wild plants, and can be dipped into at random for pleasure. However, if you find a plant you are particularly interested in - it isn't mentioned. Also the book is rather expensive. However much you love wild flowers, remember it is against the law to pick them unless you have the permission of the owner of the land! Much better to take photos!